Snap-Tex is the industry-leading acoustical stretched fabric mounting system for walls, ceilings and other interior surfaces. Engineered for superior function and design flexibility, Snap-Tex brings acoustic control to interior architecture without sacrificing aesthetics. In fact, the Snap-Tex system is often specified as a design medium first, with the added benefit of acoustic control. 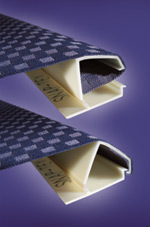 A wide range of Snap-Tex profiles are available to address almost any design need. The essence of the Snap-Tex system is it’s patented locking Snap-Tex jaw which sets the industry standard for strength and reliability. An integrated hinge allows Snap-Tex tracks to be opened wide, allowing increased access to the inside of the track for fastening to substrates. This hinge also lends itself to subsequent repairs or fabric replacement. Snap-Tex is a commercial; Class A, site-installed, highly customized system for tightly stretching fabric over acoustical substrates. Snap-Tex is typically used on walls and ceilings, but is adaptable to any surface. It’s site-installed nature assures perfect fit to all adjacent work while eliminating the gaps, sagging, or misfitting common to premanufactured panels and other perimeter systems. 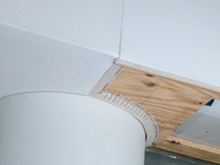 Snap-Tex track is secured around the perimeter of each panel section. 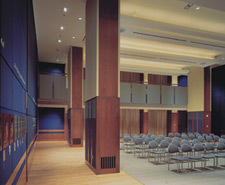 The unique design of Snap-Tex offers many advantages over other acoustical stretched fabric and premanufactured wall treatments. Snap-Tex has far more flexibility in terms of design, lead time, and value engineering opportunities. It accepts virtually any fabric, as well as substrate materials of any thickness, while having no limitation to the size or shape of the panel. Size limitation is based only on the fabric width, or the ability of the fabric to be sewn to the desired panel size. Snap-Tex has numerous edge profiles of various thickness, as well as single-track midwall configurations. Snap-Tex is exceptionally damage-resistant. Its specially designed jaw and hinge can be opened for easy and economical fabric cleaning, repair, or replacement. This can be done without damage to the track or mounting surface. Unlike premanufactured acoustical wall panels, and other site built stretched fabric treatments, Snap-Tex is able to resolve the inherent weaknesses in other products attempting to perform its function. Snap-Tex offers technical superiority, and provides flexibility, performance, and economy. All of this is done without the lead-time of premanufactured product. Three United States Patents (#4,676,016 & US6,431,251 #4,805,330) describe the original and basic structure that makes Snap-Tex unique. The primary structure is uniquely our product and is the only one-piece track system that is truly patented as a whole design. Cited by the Boston Patent Law Association as “The Most Innovative Invention” in 1988, Snap-Tex is an original. Specify Snap-Tex and bring acoustic control and beauty to your next interior architecture job.